Consummate entertainers, their energetic concerts are laced with a Maine brand of universal humor. 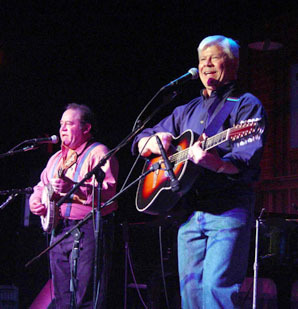 Combining their talents on six-string guitars, twelve-string guitars and banjos, Schooner Fare's distinctive vocal and instrumental arrangements have been hailed by such folk music icons as the Kingston Trio, the Limeliters, the Chad Mitchell Trio, the Clancy Brothers, Tommy Makem and Tom Paxton. Schooner Fare's many recordings receive radio play on four continents and world-wide on satellite radio. The original songs of Schooner Fare's Chuck and Steve Romanoff continue to be recorded and performed by other artists in the U.S., Canada, Britain, Ireland and Australia.